So the prestigious Geneva Motor Show is now in its 81st year and its still pretty strong and getting better. Major manufacturers from all across the world participate to showcase their new automobiles and technology. 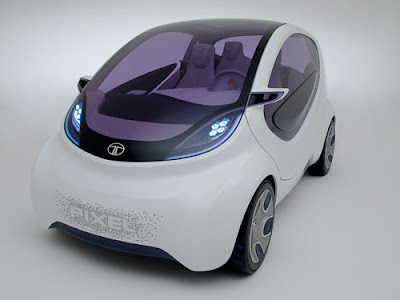 Tata Motors one of the major automobile manufacturer based in India unveiled to the to the world a new urban/city concept car named Tata Pixel. Like the name suggest the car is pretty small compact and designed to suit the needs of the urban environment where space is always a problem. The Pixel is actually a highly refined and sophisticated version of the popularly know Tata Nano, the cheapest production car on the planet but don't expect the Pixel to be as cheap. Ultimately the Tata Pixel is just a concept so you cannot be sure that if it will make it to the main stream market but surely it has a lot to offer in terms of the features. 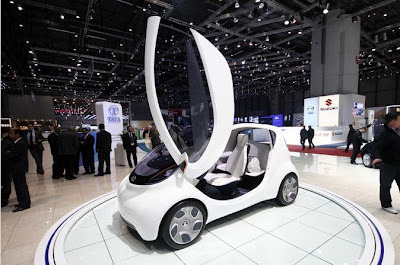 Tata is already marketing the car exclusively for the European market so if this car goes into production it will be probably targeting the middle and upper spectrum in the industry. The ultimate question is what makes the car so unique to be talked about? Well there are many things about it. Here is a point wise list of features that the concept model has to offer. 1) The car measures to about a mere three meters in length. Its pretty compact but still it has enough room inside to carry 4 adults. 2) The highlight of the car is the 'Zero turn' drive which make it possible for the car to manoeuvre and park in the tightest of spaces. The zero turn drive is a combination of a steering mechanism which lets the front wheels turn to a highly acute angle and it is further assisted with zero turn toroidal traction drive infinitely variable transmission (IVT), this makes it possible for the rotation of the outer rear wheel forward and the inner rear wheel backward. The result is a turning circle radius of just 2.6 metres. In my personal view Tata Engineers have used the Ackerman steering mechanism to achieve it. 3) The car also has some pretty good electronics for entertainment and communication functionality. Tata has come up with what it calls the ‘My Tata Connect’ which is a user interfaces which lets you control cars key functions from a smart phone or a smilar portable device with the software installed on it. Its suppose to get details about the health of the car and stuff. A lot of details haven't been talked about in the official release. 4) Another really cool feature is The 'scissor' doors which rotate upwards from the front to allow passengers to effortlessly enter or exit the Tata Pixel, even in the tightest of spaces. These types of doors are also called Lamborghini doors or suicide doors. Well the title is technically wrong cause this car is rear engined it should be rather called as under the trunk. Its got a 1.2L Turbo charged diesel engine. Tata calls its engine a low-friction design. It features a variable coolant and oil pump also has something called the rapid warm-up technology which heats up the diesel engine for a quick start. It also features an optimized aerodynamic drag design low rolling-resistance tyres, stop-start technology and intelligent battery charging. The economy figures are pretty good it can do a 100 km in 3.4litres of fuel and has low emission figures of 89grams of CO2 per kilometer. Over also the pixel has great looks to it. Its designed to serve the daily needs of urban commute, a good concept car, more practical. In these day when fuel prices are getting really high and parking space is very tight its a good solution to the problems. I think other major car manufacturers should also give a thought to these kind of city concepts so we have less congestion and more space and less of the polluting fuel guzzlers on the streets.